To create something fit for a king. A task that adidas has been tasked with for well over a decade. The production and creation of a golden slipper has been something that has long plagued the three stripes, and something that has long been an issue within the minds of serious boot fans. For the time where Messi had his own signature line, the quality didn’t quite reach anywhere close to the standard we’d want attached to a talent level like Barcelona’s #10. Now, adidas has decided to house their headlining act within the confines of a specially designed Nemeziz model. The original Nemeziz made magic with AgilityKnit in the forefoot and a unique collar to start churning the minds of boot nerds. It signaled that adidas still had a swagger to go along with the bold ideas that caused the adidas revolution in the first place. It quickly became a favorite with any and all that gave it a chance, and the 17.1 clearly rivaled the Predator 17.1 as the best that adidas had on offer. It was also the first time that adidas decided to move away from a MESSI specific silo and merely alter a boot to fit the needs of Argentina’s brightest star. It was a truly enjoyable boot, and offered a unique feel from the standard version of the Nemeziz. Has the second version of the MESSI Nemeziz crafted the same level of quality for Messi while still offering a unique experience, or has adidas taken one of their prized possessions and taken a wrong turn on the way to success? Unlike Messi’s past magic wheels, the actual look of this boot barely varies from the standard Nemeziz. Outside of different colorways, the entire build and construction of the boot exactly mirrors the look of the Nemeziz. 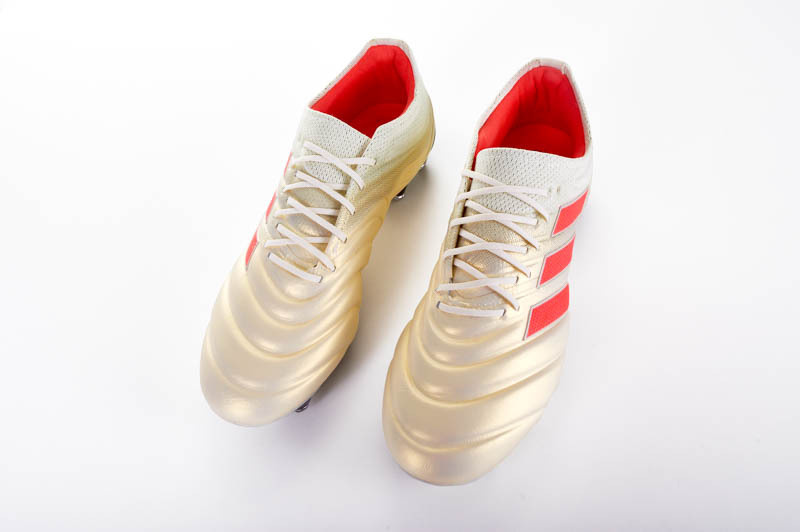 Crisscross lines covering the upper, three stripes on the outside of the boot, a Messi logo on on one side of the heel and a “MESSI” callout on the other greet you upon closer inspection of this boot, and it isn’t until you actually turn the boot over to the soleplate that any major differences make themselves known. The soleplate is a design that we’ve actually seen from Messi specific boots for quite some time. 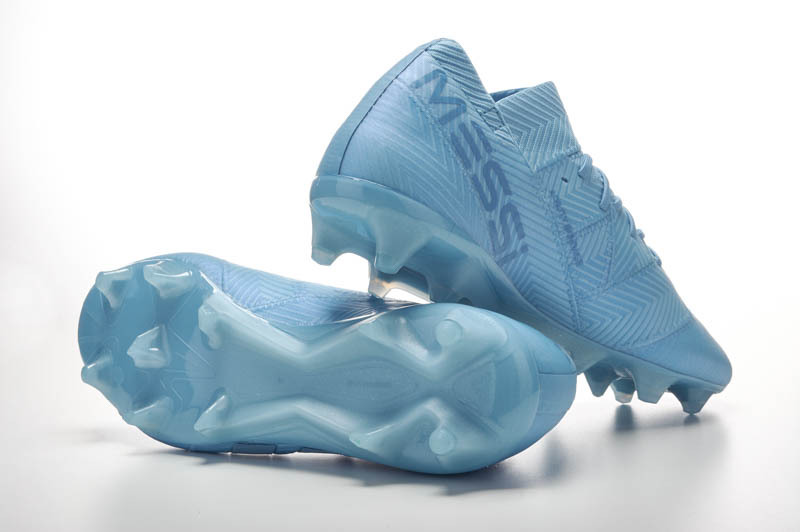 Where the standard Nemeziz involves some oddly shaped, almost tear-drop outline studs on the soleplate, the MESSI Nemeziz is closer to conical studs and is actually identical to when the boots were marketed as being able to be used both on AG/FG. Outside of the slime green version we saw in Russia at the World Cup, the colorways that adidas has chosen for their brand talisman are quite attractive. 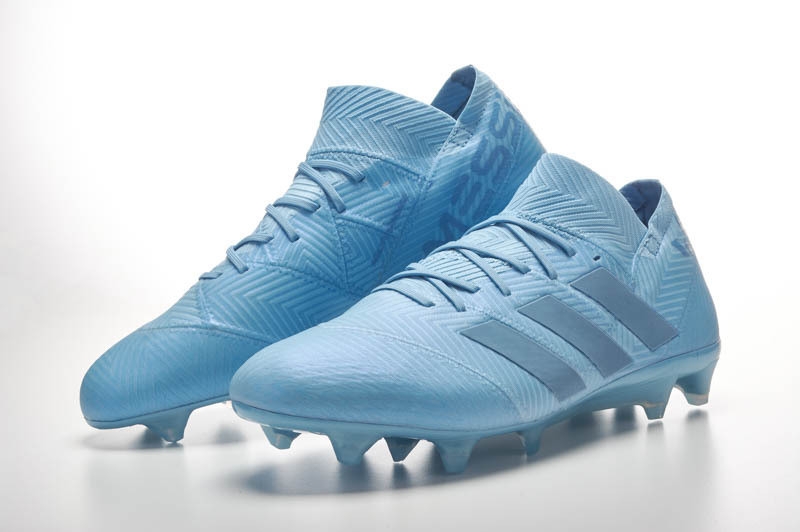 From the lighter blue boot that would look like a perfect companion to any Easter Sunday clothes, or switching over to the white/blue MESSI that launched more recently, adidas has done a decent job providing quality color options for Messi. Simply looking at the roster of the standard adidas Nemeziz and adding in the proud owner of the MESSI version shows that this is a boot whose best features should be showcased during time on the ball. The Agility Weave makes the only true departure from what we enjoyed of the 2017 model, and we were anxious to see if the touch on the ball was altered or if it was still as buttery smooth as we remember from the original version. However, adidas has been toeing the line between an upper that lets you feel as close to the ball while giving enough of that lining to bring top-notch comfort. Have they stuck with what worked last time, pushed the padding too far, or stripped the boot back too much? Luckily, adidas decided to make sure that the time on the ball that made the original Nemeziz a joy was something that continued being impressive. 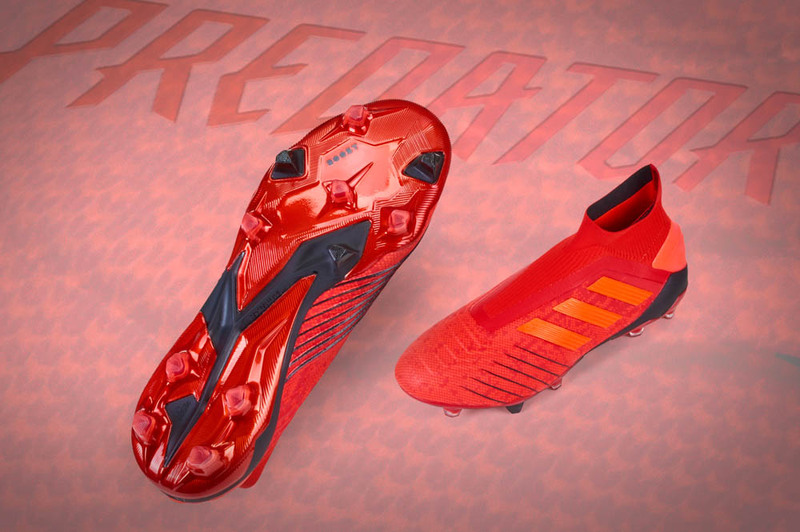 The boot’s upper shines during your time on the ball, but it is at full pace, much like the player whose name is emblazoned on this boot, where the Nemeziz starts to reach the height of its powers. Practice makes perfect, and adidas is truly creating a blend between too much padding and too little, a very noteworthy achievement that is extremely noticeable as you zip through space with the ball. Despite two different materials labeled with “Agility,” the touch for the ball doesn’t change whether dribbling with the inside or outside of the forefoot or receiving the ball on the instep. It’s impressive, especially considering that the Agility Weave is a bit thicker than the Agility Knit on the original Nemeziz, but not surprising. 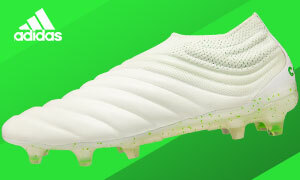 The part of the boot that sits under and around the laces, the area where most of your shots and strong strikes of the ball occur, feel clean and crisp as you connect with a ball. It’s something you don’t necessarily expect from a boot that feels marketed to players who prefer to have the ball at their feet making quick chops around defenders, but shooting in the Nemeziz is a blast. In fact, the area that has the least padding is right where you’d drive through a ball…using your laces, as most coaches have commanded you to all your playing career. That satisfying ping, the instant sensation of the drive you’re trying to force through your shot, and the instant satisfaction as the ball flashes from your foot to its final destination. If you’re anything like us, could be the top corner or it could be over the netting that sits behind the goal. A lovely reminder that, even if it feels like a great boot, it doesn’t immediately turn you into Messi. One of the biggest qualms with the top-tier adidas boots is lockdown. However, that issue is mostly non-existent on the laced options of the adidas stables. Combined with a responsive soleplate and a quality lacing system, the Nemeziz is always a locked-in and smooth ride that never feels like its going to roll over on a hard plant or give way during an intense cut. While Messi might be the perfect player to execute hard shifts and turns, he wouldn’t look quite so nimble if his footwear didn’t respond to his lofty commands. The studs on the MESSI Nemeziz are truly unique in the boot world. The studs furthest forward and farthest towards the back are conical, with every other stud being a triangle with slightly rounded edges. It’s a great pattern for firm ground surfaces and you never find yourself worrying about whether your boots are going to give at the right moment or slip when you make a strong plant. In terms of using the boots on an artificial grass surface, the Nemeziz is still not AG/FG rated by adidas, but it hasn’t changed much since it was. We’ve found that adidas has some great turf options on there own, but this might be a good purchase if you find yourself playing on both firm ground and artificial surfaces a lot. While the adidas “revolution” a few years ago felt like it was crafted to shrug off boots that were perceived as dead weight and bring excitement to the three stripes again, the notion that comfort would be the one aspect that adidas could claim across their entire roster wouldn’t have been our first guess. The newest Nemeziz is no different and is impressive from your first interaction, an aspect that continues to be seen as less of a surprise as adidas continues to strive for laced or laceless comfort straight out of the box. Ever since the first PureChaos, adidas has been finding the blend between padding to be thin enough for a great touch and thick enough for supple comfort. The Nemeziz has also walked that fine line, but (at least for us) with an even greater emphasis on the comfort. The newest Nemeziz is no different. The area covered in Agility Bandages and the Agility Weave has a soft, suede-like liner that runs from almost the last lace-hole all the way to the edge of the toe-box. It’s very plush and has enough give to work with your foot from first wear until the boot has been broken-in. The padding doesn’t go away as you approach the heel, but the material changes to a synthetic. The padding gets a bit thicker right around the heel and then ends about an inch above the insole. If you don’t find the correct size or your foot doesn’t sit locked in after the boot is properly laced up, this is the area of the boot that could cause some hotspots to occur. However, if you get go true to size, then you shouldn’t experience anything other than enjoyment with the Nemeziz. The Agility Weave does take a little bit longer to soften up than the areas covered by the Agility Bandage, but the weave will soften up and blend with the rest of the boot after a few hard run-outs. If you are a player who hasn’t tried this boot out before (and you prefer wearing socks cut below the ankle when you practice), be aware that the top of the ankled collar does sit tight on your foot. With socks that extend a bit higher, it won’t be an issue, but short socks could see that area at the top of the “tongue” become a bit of a sore spot. Although the heel seems to sit a bit higher, it shouldn’t be any different in terms of comfort than any other boot you’ve worn in the past. The soleplates on most adidas boots do start their lives with a bit of stiffness, but it’s meant to aid responsiveness and isn’t uncomfortable. It becomes even less of an issue as the soleplate does start to loosen up as the boot breaks in. After three or four sessions, every piece of the boot should be at its peak level of comfort and feel. As we’ve mentioned, there isn’t a ton of difference between the MESSI Nemeziz and the standard version. In fact, the only differences are the stud shapm that e, stud pattern, and the soleplate build right through the midfoot. That doesn’t include cosmetic differences, but there aren’t many of those differences either. The most intriguing aspect is how different the boots actually are for Messi and what we get from the retail version. We think that offering fans the opportunity to own the actual version that Messi prefers would actually increase interest in the boot, but that’s just us. The MESSI edition of the Nemeziz can be found for the same prize as the standard Nemeziz, which sits right about at the standard tier for top-tier boots today. For right around $200, the MESSI Nemeziz can be your newest toy. 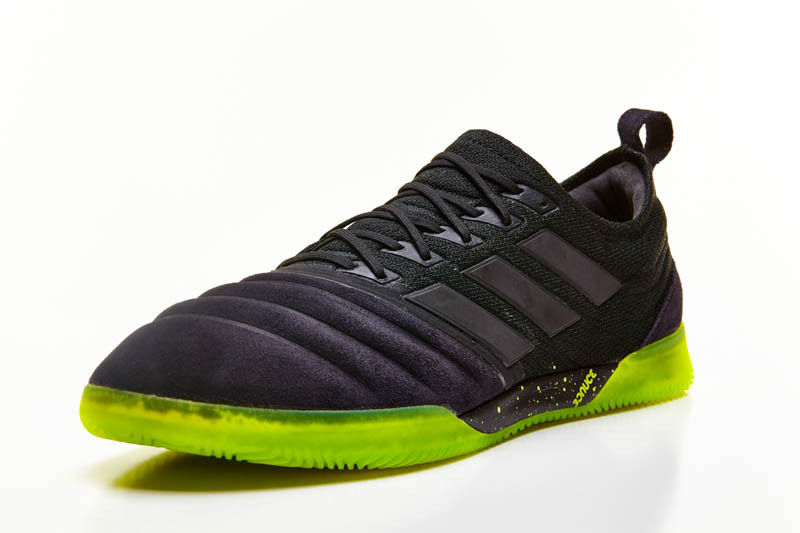 The boots come with a boot bag and the build of the Nemeziz ought to certainly last you a bit longer than one season, but the price tag is something you’ll have to decide on yourself. The MESSI Nemeziz is impressive, but all top-tier boots in today’s world sit at a price point where being impressive isn’t enough. It’s all a matter of whether your wallet has the stretch or not to accommodate the purchase. If your bank account will allow, then this is a stellar option for your next season. The battle for the best that adidas has one offer is currently being fought among all of the 18.1 models. The Predator continues to be impressive, the X is finally a decent option outside of the + model, and the Nemeziz continues to be an incredibly enjoyable surprise every time we get our hands on a pair. The MESSI Nemeziz continues this tradition of being a pleasant surprise and feels like a boot that still doesn’t quite get the credit that it deserves. If you’re hunting for a boot that offers a soft, padded touch while still feeling close the ball and responsive, you’ve found your next purchase. Factor in one of the last remnants of the adidas AG/FG stud patterns and the collar build that pleases both sides of the “collar aisle,” and there’s something here to please everyone. It doesn’t hurt that it also represents a living, still playing, legend of the sport.